The summer of crazy travel continues… One of my projects at work had a requirement to test it in a severe desert environment, during the summer. So I found myself packing up and heading out with two crazy coworkers to…. Gold Canyon, Arizona (actually, to a private ranch east of there) to bask in the daytime highs of 116°F highs and 93°F lows. But it’s also where I grew up (and my parents still live there), so I decided to head out a day early to do a few errands for the project and have dinner with my parents before heading out into the desert. However, I ended up having a few hours free, so I met up with my friend Allyson for lunch. 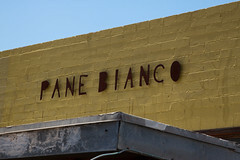 Located in a modest building set back from Central Avenue, Pane Bianco is quite different than it’s pizzeria counterpart. It’s primarily run by Marco Bianco, Chris Bianco’s brother, who is often making the fresh bread that’s the cornerstone of the sandwiches here. While often bustling, it’s not the crazy hive of activity with hours of waiting that Pizzeria Bianco is, it’s actually a quite accessible little cafe where you can generally get a seat with little or no waiting. The dining area is a nice, well-lit space that holds a small bar and several large communal tables (that were indeed quite communal—the other end of our table was being used by Marco for a meeting with one of his staff members, who also pleasantly chatted with us as we dined), with the specials on the wall on a giant chalkboard. 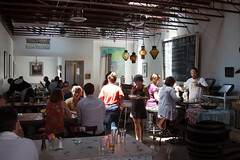 The space conveys the message well: this is a casual cafe for enjoying some simple sandwiches. And indeed the menu is quite simple, it’s basically sandwiches (about 4-5 standard varieties, plus a number of daily specials on the board), salads (the same), and light desserts. My choice was quite easy: I really enjoy a good sopressata, so when one of the sandwiches was a Sopressata, Provolone, and Roast Pepper sandwich, I couldn’t say no. And I’m glad I did, since this was a really great sandwich. First of all, the bread was a perfectly done panini loaf, with a nicely crusty and toasted exterior and a chewy interior (remember in my Pizzeria Bianco review how I mentioned that if you didn’t get an order of bread, you were missing out? This is the same level of quality). 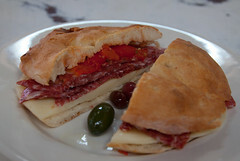 Add in some plentiful layers of nicely flavored and tender sopressata coupled with some layers of sharp provolone that was soft but quite flavorful, and the resulting sandwich was pretty much spot on with texture and flavor. 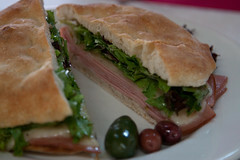 And the quality wasn’t limited to my sandwich; Allyson’s Mortadella sandwich off the special board was also a hit. The richer, more mature cousin to bologna, this mortadella was rich, flavorful, and had some nice little chunks of pork fat in it, making for a sandwich that pleased Allyson as much as I was pleased by mine. Dessert was straight forward: we both opted for the same thing, freshly-made Italian ice, chocolate flavor. The resulting dessert was one of the most pleasant desserts I’ve had recently. The texture of the ice was light and refreshing, a perfect counterpoint for the 116°F weather outside, and not the dense creaminess that I get from most similar dishes. 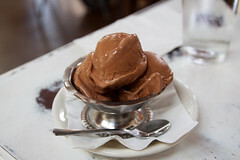 Being an ice and not an ice cream, the flavor was that of a nice dark chocolate taste, being rich without being heavy. The result was the perfect summertime treat, one that I’d gladly get again. 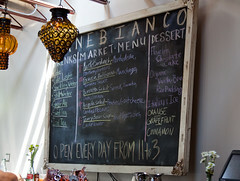 Overall, Pane Bianco was just as great as I remembered from my previous visits: a simple menu, executed perfectly, with some nice sandwiches and desserts that exactly meet my expectations of a good Italian Cafe. I will continue to come back when I’m in the area. Looks great! Nice pictures. We would love to give this place a shot. Tasty sandwiches sound great.